In a very competitive context with a clientele that naturally continues to demand more, Trigano VDL commits to an ongoing approach to innovation and continuous improvement. Quality control begins long before the birth of a motorhome or caravan. Upstream, a team of SQA (Supplier Quality Assurance) technicians provides support for suppliers during development and takes care of non-compliance at reception or during the manufacturing process. We have top-performance equipment (climatic condition reproducer, motorized tensile test bench, microscope camera, etc.) to test our parts and assemblies in order to guide technical choices toward the most appropriate solutions. Production teams are organized to deliver a compliant vehicle to the next work station. Certified assembly-line workers test the water, gas and electricity networks according to instructions established using specific metered equipment. At the end of each line, a Quality Controller checks the entire vehicle. 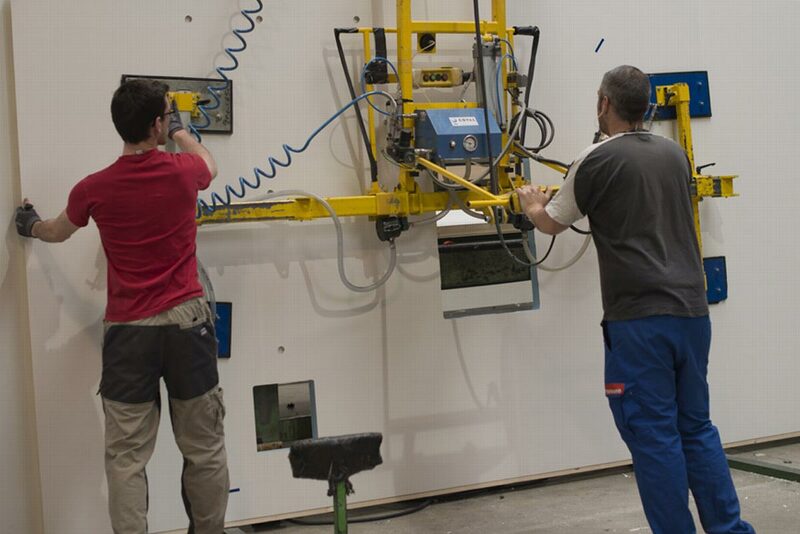 Since safety is a crucial concern at Trigano VDL, a company project known as “PACTE” (standing for the French equivalent of “continued improvement through teamwork”) was put in place and involved the redesign of several workshops to improve working conditions. Daily collaboration between the HSE team (Health, Safety, Environment), the Methods Service and the CHSCT (a committee focusing on health, safety and working conditions) enables identifying risky situations and implementing the pertinent actions for improvement. To update their professional skills, our employees are retrained each year, in particular when they are required to operate machinery or work while the power supply is connected. In case of accident, a rescue team is immediately operational, and in case of fire, a team of volunteer firemen has a fire engine available for use. In addition, the plant has a latest-generation fire alarm system..
From an environmental standpoint, Trigano VDL commits to limiting the consumption of gas and electricity through the installation of high-speed doors in the workshops, double-glazed windows in administrative buildings, the replacement of traditional neon lamps with LED spotlights and the installation of movement sensors. A centralized technical management system for energy steers a major part of electrical consumption in the plant and reduces lighting time; it will soon be able to adapt heating to the presence or absence of personnel. Our waste is recycled by specific reprocessing industries. In the context of ICPE (Installation Classified for the Protection of the Environment), we constantly keep watch on the impact of our activity. In particular, we check the quality of subterranean water (heavy metal content) and the type of industrial waste emitted into the atmosphere by our dust collectors, painting workshops and boilers, as well as the sound level of activity at plant boundaries.